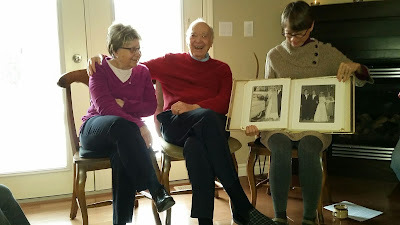 Bob Wells and JoAnn Gignac were married 60 yrs ago on Feb 1, 1958 at 10 am by Fr. Larry Mousseau at Holy Names Catholic Church in Windsor. 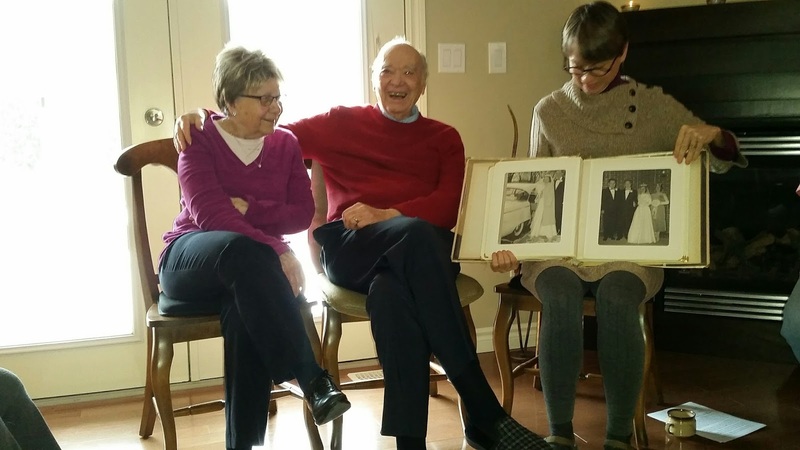 A couple weeks ago, I sat down with mom and dad to hear stories about how they fell in love and why, their dating years, engagement and wedding day, as well as the early to recent years of their marriage. I learned about their values and how they instilled these in what they describe as their "3 beautiful children." 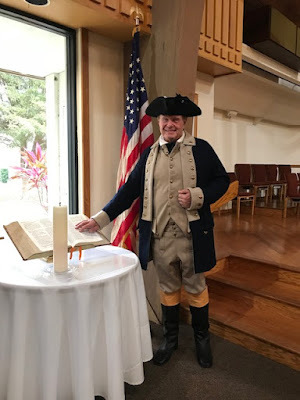 They told me about their challenges and successes as a married couple and how they negotiated their differences as a "stubborn Englishman and fiery Frenchwoman." Soon, I will ask mom and dad to share with us some of the wonderful stories that they told me about their life together. Bob and JoAnn met on a blind date 2 years prior to their wedding at a house party. Dad's work colleague, Jim Kirwen and his girlfriend and a friend of mom's, Joanne Cork engineered their connection. Mom was in training to be a nurse and dad was working at Ford's as a cost accountant. Mom said she was attracted to dad's personality. In her words, he was an "upstanding person, had a responsible job and good looks." Dad said mom "was good looking and had nice legs." He like that she was easy-going, not nitpicky and, mostly, because she was kind. "She let me do what I wanted", he said. Mom and dad, please tell us the story of your first date and courtship years, including dad's visits to St. Thomas where Mom was doing a nursing practicum in psychiatry. 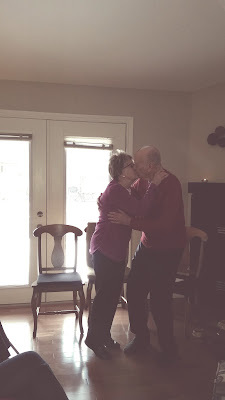 Mom and dad were engaged on the night of mom's nurse's prom at Lakewood golf course, 1.5 years after they had met and before they were married there 6 mo later. Can you tell us about that night? When we spoke, I asked you about the values you instilled in us as children. Can you tell us about these? As with any relationship, especially in marriage, mom and dad experienced challenges and successes. Can you tell us how you worked through your differences and some of your successes? Please don't forget to tell the story about the puzzle. I invite all of us to add stories and/or to express our appreciations Mom and Dad, Grandma and Grandpa. We know that one of your joys, unlike many of your friends, is that none of our marriages have ended in divorce. You celebrate and uphold the goodness of family that includes grandchildren and great grandchildren, our Hailey now and maybe more to come. From 60 years of your married life, what wisdom words can you give us all about life and love? Bob and JoAnn, your anniversary remembers and celebrates the covenant of love that you entered 60 years ago before God, and your family and friends as witnesses through the Sacrament of Marriage. I invite you now to renew before God and we, the family you have created, tended and loved, the promises you made to one another 60 years ago. Bob and JoAnn please stand and face one another as you renew your commitment in your Sacrament of Marriage. 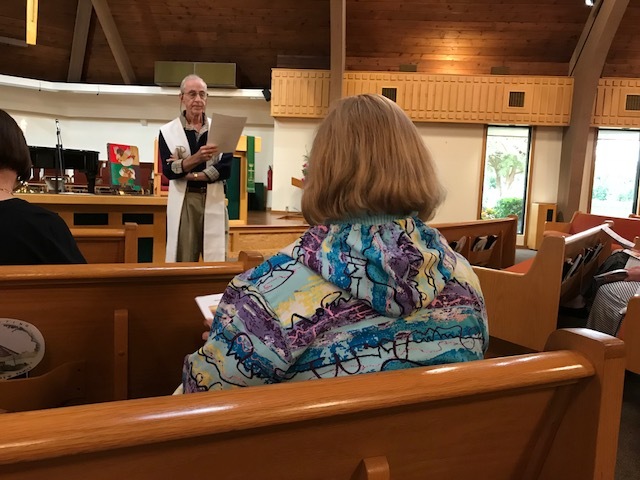 We ask You, Holy One to pour forth Your Spirit of mercy, love and compassion upon Bob and JoAnn so that their marriage vows may continue to be strengthened by Your divine grace. for by your inspiration I chose JoAnn as my wife. Thank you for the gift she has been to me and the face of God that she is. for by your inspiration I chose Bob as my husband. Thank you for the gift he has been to me and the face of God that he is. You have been lovingly by our side. We have been fortified by Your love, our God and have done our best to be true witnesses to the covenant and promises we made in Your holy name, 60 years ago. Continue to guide us in Your wisdom and in the ways of Jesus Christ. in good times and in bad, in sickness and in health, for richer and for poorer until death takes us into Your eternal life, together forever. Bob and JoAnn, now in the winter of your lives, you rise and fall with the sun, sunrise and sunset inseparable. and be a presence of laughter and joy in ordinary moments. May God continue to fill your home and hearts with love for each other and the love of family and friends. 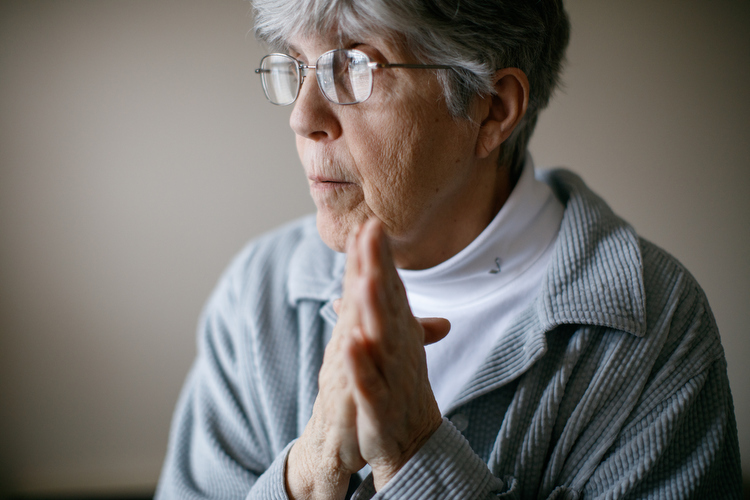 May God help you see with eyes of hope, especially in the graces and hardships of aging. Please extend your hands in blessing our couple. + God bless and keep JoAnn and Bob. Hold them in the womb of Your loving embrace. Remain close to them all the days of their life together as they grow in this Sacrament of Marriage, living examples of the love of Christ. We ask this through Jesus Christ, with us always. Sister Carol Gilbert OP, left, and Sister Ardeth Platte OP, right. 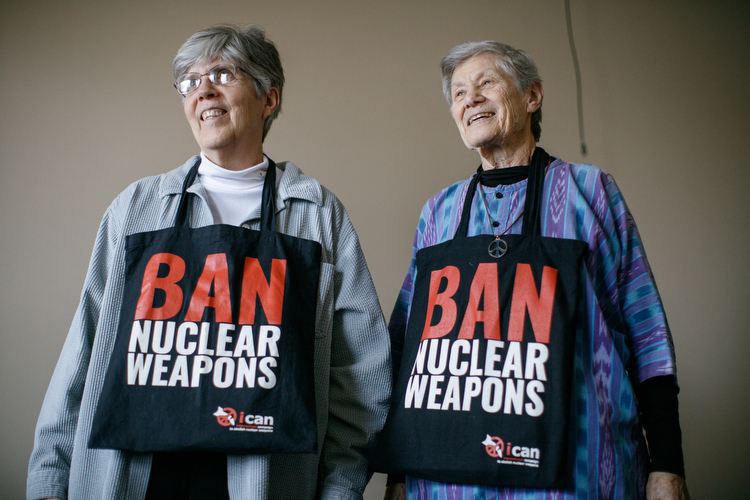 Sister Carol Gilbert, OP and Sister Ardeth Platte, OP, Michigan natives visiting Marywood from Washington DC, presented "A Yes for Humanity: One Step Closer to Nuclear Disarmament" on Tuesday, January 30. 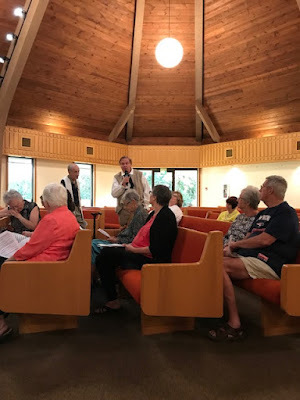 They spoke about being part of the International Campaign to Abolish Nuclear Weapons (ICAN)delegation to the United Nations last spring and summer that was instrumental in The UN Treaty on the Prohibition of Nuclear Weapons. Presider: Welcome, everyone. While today is the “fifth week in Ordinary Time,” there is little “ordinary” in it. When this liturgy is ended, that which makes today “extra – ordinary” will take place…the Mary Mother of Jesus Annual Meeting. And this, then, is when we, as the larger community, will briefly review our activities in 2017 and make plans for this calendar year, 2018. At the heart of those plans is the understanding and compassion that we have for ourselves and for our brothers and sisters, as a MMOJ community and in our external ministries. “Be compassionate, as your loving God is compassionate” is what Luke’s Jesus tells us we are to do. What a standard! Presider: Let us pray as we come together in this sacred place to break bread and share in the banquet of love in the name of God, our Creator, of Christ, our liberator, and of the Holy Spirit, our Sanctifier. ALL: O Holy God, in this journey into the heart of compassion, we celebrate your love as we see it unfolding in the healing and wholeness of your creation for everyone and everything. We ask you to open our hearts to the message of the Gospel so that your inspiration and peace may rule in our hearts, your justice guide our lives, and your love direct and support us in our concern and care of one another. You call us to recognize and warmly welcome everyone who comes through our doors as your presence among us, which they are. In communion with Jesus, our brother and with the power of the Your Spirit, we will try to live the example of your love each day. Amen. Presider: Compassionate God, to you all hearts are open, no desires unknown, and no secrets hidden. We thank you for sending your Spirit to us so that we may live more fully according to your will for us and we are thankful that you have called us to be your blessed people. ALL: Our God, we need to hear Wisdom’s messages, to faithfully understand them, and to respond to them with compassionate actions with our brothers and sisters. Loving God, we ask for your forgiveness for our hurtful actions to people of other genders, beliefs, nationalities, classes and races. Help us learn the virtues of pardon and peace so that we may – in turn – learn to forgive others their failures in their caring for us, one another and for our planet Earth. Strengthened by your love and blessings, may we be the pardoning and forgiving people you created us to be. Amen. Presider: Glory to God in the highest, and peace to all God’s people on earth. Psalm: 147 Responsorial: God heals the broken hearted. Second Reading: 1 Corinthians 10: 16-17 All: Thanks be to God. Gospel: Luke 6: 27-38 All: Glory to you, O God. Thoughts for the journey (to Stewart Hall for the Annual Community Meeting). Being Compassionate as our loving God is compassionate…as practiced in the MMOJ community and its external ministries. What examples do we see in our annual review and plan? ALL: We believe in one God, a divine mystery beyond all definition and rational understanding. God, the Creator, is the heart of all that has ever existed, that exists now, or that ever will exist. We believe in Jesus, the messenger of God’s Word, bringer of God’s healing and the center of God’s compassion. Through his incarnation, we have become a new people, called beyond the consequences of our brokenness. We believe in the Spirit, the wisdom that strengthens our call to follow Jesus as a vehicle of God’s love, a source of God’s compassion and truth, and an instrument of God’s peace in the world. And we believe that God’s kin-dom is here now and will be forever. It is stretched out all around us for those with eyes to recognize it, hearts to receive it, and hands to share it with everyone…with no exceptions. In all of these, we surely believe. Presider: We are a people of faith; we believe in the power of prayer. And so, mindful of God’s unconditional love, we lift up the needs of the people at this time. Our response is: Compassionate God, bless our petitions. Presider: That those who suffer abuse at the hands of their brothers and sisters may be healed and empowered, we pray. ALL: God of all compassion, bless our petitions. Presider: That the hungry and homeless receive the food and shelter that they so badly need, we pray. R.
Presider: That those who lack sufficient and adequate amounts and types of clothing may receive what is necessary for their health, we pray. R.
Presider: And for what else do we pray at this time? Other Intentions are followed by R.
Presider: Healing God, we ask you to strengthen us in our awareness and concerns for one another, here and throughout the whole world. We ask you to bless our prayers and efforts for justice and equality so that, with our sisters and brothers we may promote cultures of peace and nonviolence in our world. R.
Offertory Hymn: “Song of the Body of Christ” #324 verses 1, 2, & 3 only. Presider: Blessed are you, God of Creation, through your goodness we have this bread to offer…this grain of the earth that human hands have made. It will become for us the bread of life. ALL: Blessed be God forever. Presider: Blessed are you, God of Creation, through your goodness we have this wine to offer…this fruit of the vine that human hands have made. It will become for us our spiritual drink. ALL: Blessed be God forever. Presider: Jesus, who has often sat at our tables, now invites all of us to join him at his. (Everyone is welcome at God’s banquet table.) When everyone is around the table…. ALL: We are in communion with everyone, everywhere – the young and the old, the first and the last, especially our brothers and sisters who are oppressed and marginalized anywhere. May we share God’s gifts of peace and compassion to all of them by loving tenderly, doing justice and walking humbly with them everywhere. Presider: And so, we greet one another at this table. ALL: Namaste! Namaste! Namaste! Voice 2: Ever Loving God, we do well always and everywhere give you thanks. In you, we live and move and have our being. You have given us the model (in Jesus) and the manual (the gospels) for living the life that you created for us. And in your Spirit, you have given us the strength to carry out that plan. Voice 3: We thank you for the gift of Jesus in history – and the gift of Jesus in faith. Through him, you breathe life into us. He was moved by his vision of your everlasting presence in everyone he met. He revealed you in everything he did in his life well lived. He showed us, through his example, not only how we should live, but also the price we may be called to pay for being faithful to his teachings. Voice 4: And when his time on earth had come to its end, Jesus – aware of his destiny and accepting of it – laid down his life for the values that he deeply believed, lived and taught…his conviction that love is stronger than death. He provided an example of that for us and for others in the ages to come…he opened wide his arms on a cross and died. Then the Spirit, in raising Jesus for the dead, showed all of us that life is eternal and that love is immortal. We know that Jesus is with us today as he will be through the end of time. ALL: O God, let that Spirit of life, healing and wholeness come upon these simple gifts that we have brought from our fields and placed on this, your table. May she make this wheat and wine holy so that they will become for us the Body and Blood of Jesus, our brother. ALL: Christ has died. Christ is risen. Christ lives through us in the world today. Voice 5: May all of us who share this sacred meal be strengthen in our unity by the grace of the Holy Spirit. And may that Spirit, that Wisdom that moved in Jesus, move just as freely in our lives as She did in that of Jesus. 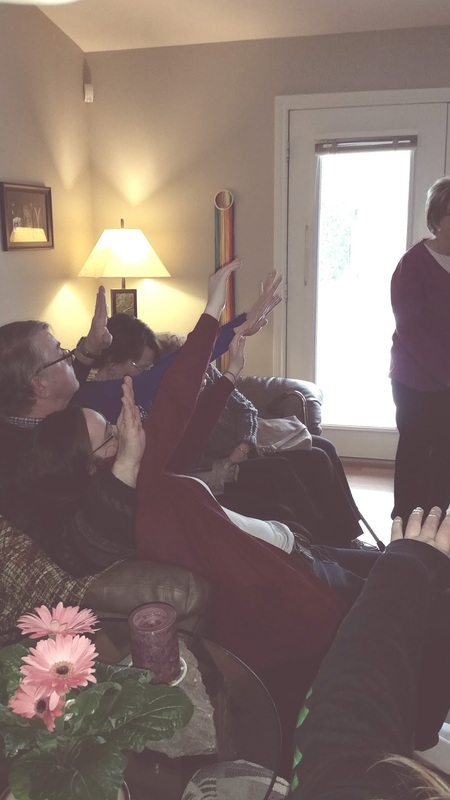 ALL (holding hands): Our Father and Mother, who are in heaven, blessed is your name..
Presider: Understanding God, we have just prayed that “your kindom may come” among us. Strengthen us with your grace and love so that we can truly open our hearts to your kin-dom and contribute to making it come in the fullness of time. ALL: …grant us that peace. O Loving God, following the example of Jesus and with the strength of the Spirit help us spread that peace through the world, to everyone, everywhere, no exceptions. Amen. Presider: May the peace of God be always with us, and let us extend that peace to one another as we join hands in a circle of love and sing: “Let There Be Peace on Earth” #532. Presider: Loving God…. ALL: you call us to spirit-filled service and to live the Gospel of peace and mercy. So we will live justly. Presider: Loving God…. ALL: you call us to be your presence in the world and to be bearers of understanding and compassion, forgiveness and healing, everywhere in your name. So we will love tenderly. Presider: Loving God…. ALL: you call us to speak truth to power. So we will walk humbly with you. Presider: This is Jesus who liberates, heals and transforms us and our world. All are invited to partake of this sacred banquet of love. All: We are the Body of Christ. Presider: Compassionate and Caring God, as we come to share the richness of your table, we cannot forget the poverty of so many of our brothers and sisters, our families and neighbors, all part of one body. ALL: We cannot eat this bread and not remember the many who are hungry. O God, your world is one world and we are stewards of its nourishment for your whole family. ALL: We cannot drink this wine and not remember the many who are thirsty. O God, this very earth and its people cry out for environmental justice. Presider: O God, we cannot listen to your words of peace and not agonize about a world at war’s doors. Presider: May wonder and thanksgiving fill us, may compassion fully fill our beings, that we may heal the numbness that continues because of our society’s injustices. May we continue to be the face of God in the world and reflect that well to one another. ALL: May our hearts be glad on our journey as we dream new dream, see new visions and evolve a new heaven and earth. May we be vehicles of compassion and care for our needy brothers and sisters, wherever they are. May we work to shape new cultures of peace, justice and non-violence in which everyone may find their lives meaningful and satisfying for themselves and the peoples on a safe and secure planet. Presider: May we learn to bless, honor and hold in reverence all creation, the earth and one another. ALL: Powerful God, Creator of all that exists, we have looked for others to save us and to save our world. Yet we are the ones who have been called, blessed and commissioned to do that. And with your strength and guidance, we will be successful. Presider: As we leave here in the peace of Christ, let us be the people that God created us to be. And may we always remember, with gratitude, that we are the face of God to the world. ALL: Thanks be to God! Let it be so. 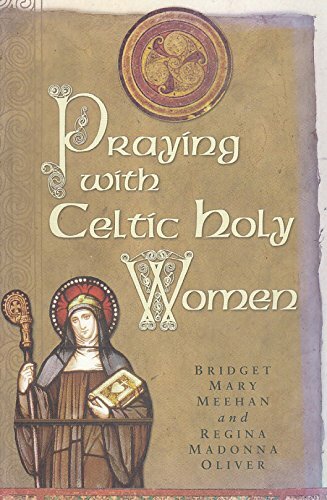 "From the time I first directed my mind on God," said Brigid (Mary of the Gael',"I have never taken it away from him." According to the Leabhar Breac, Brigid was such a wonder-worker that her soul must be a blazing sun lighting up the heavenly city. Here we present an edited version of the Life of Brigid as told in the Leabhar Breac: it portrays Brigid as continually subverting normal order with extraordinary miracles. Daughter of Dubhthach and a slave-girl named BroicseachBrigid was the daughter of Dubhthach MacDreimhne. Dubhthach had bought a slave-girl named Broicseach and soon she became pregnant by him. Dubhthach’s wife, Breachnat, was furious and threatened to leave him if he did not sell Broicseach to somebody living far away. But Dubhthach didn’t want to sell her. One day, while Dubhthach and the slave-girl were going past the house of a certain druid, the druid hearing the noise of the chariot, came out to greet them. The druid foretold that they would have a wonderful daughter whose fame would spread far and wide because of her power and virtue. After this, God sent two bishops – Mel and Melchu – to Dubhthach and when Mel learned of Breachnat’s anger he told her that her own descendants would serve the descendants of the slave-girl. The bishops advised Dubhthach to sell the slave-girl to another druid who came that way, but not to hand over the infant in her womb. Dubhthach agreed to this and the druid took Broicseach to his home. Soon after, another druid from the territory of Conaill purchased the slave-girl. This man prepared a great banquet for the king of Conaill and it so happened that the queen at that moment was on the point of giving birth. A prophet of the learned class who happened to be present was asked if this were a lucky time for a royal birth. He replied that the child born next morning with the rising of the sun would have an outstanding destiny. At day-break the slave-girl, Broicseach, was going into a house, holding a bucket of buttermilk in her hand. She had one foot inside the threshold and the other outside the threshold when Brigid was born. The servant-girls washed the baby and the mother with the buttermilk which was in the vessel. 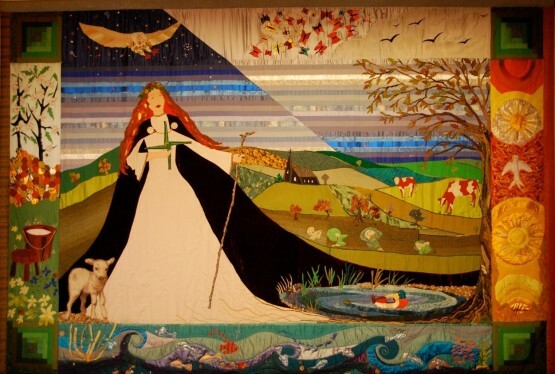 Brigid was born on a Wednesday, on the eighth day of the moon, at Fochairt Mhuirthemhne. Raising up the queen’s babyBrigid was then taken to the place where the queen’s baby lay dead. When Brigid’s breath reached him he became alive and well. The druid and Broicseach and Brigid then went off to Connacht where they settled down. Brigid in ConnachtOne day, the people of the area saw that the house in which the child Brigid was living was on fire. They rushed to the house to put out the flames but found on arrival that there was no fire at all. They concluded that the child was filled with the Holy Spirit. Once, while asleep, the druid saw three clerics, or three angels, coming and pouring oil on Brigid’s head to complete the rite of baptism. The three clerics instructed the druid to give the name Brigid to the child. Brigid was not accustomed to take the ordinary food available to her. For this reason the druid obtained a white cow with red ears and she used to drink the milk of this cow. 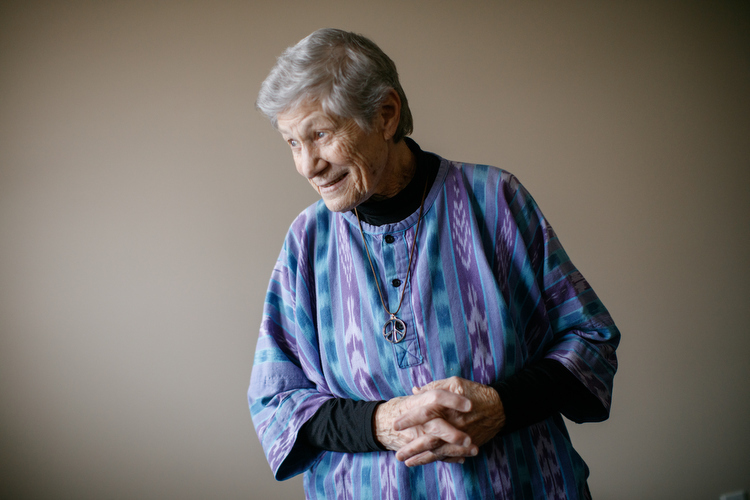 As Brigid grew up everything under her care increased and flourished. She took care of the sheep, of blind people and of the poor. Brigid back with her father DubhthachWhen Brigid grew up into a young girl, the druid gave her back to her father Dubhthach, in the area of Uíbh Fhailí. Some time later, guests came to Dubhthach’s house and Brigid was preparing five portions of meat for them. It happened that a hungry dog was passing by and Brigid gave him one of the portions of meat. When he had eaten that, she gave him another. Dubhthach, when he saw this, asked, “Have you all the portions?” “Count them,” Brigid replied. He did so and all five portions were there. “That girl works many wonders,” said her father. On one occasion, Brigid attended a Synod of Leinster. It happened that a holy man who was present had had a vision in which he saw Mary coming to the meeting. When Brigid entered, this man said: “This is the Mary I saw in a vision,” and from then on, she was called Muire na nGael – Mary of the Irish. Brigid’s miracles so impressed the druid and his wife that they became Christians. The druid gave Brigid a herd of cows and made her mother a free-woman. Brigid and her mother Broicseach returned to Dubhthach. Brigid gives her father’s sword to a leperDubhthach, however, was not over-pleased to have his daughter back as he feared his wealth would diminish if Brigid handed over his goods to the poor. He decided to sell Brigid to Dunlaing MacEnda, king of Leinster, as a servant, to grind corn. Brigid and her father went to the king’s fort by chariot. When they arrived, Dubhthach went inside to meet the king, leaving Brigid and his sword in the chariot. While Dubhthach was inside, a leper happened to pass by and Brigid gave him her father’s sword. 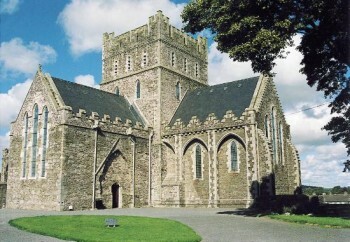 Dubhthach was furious at the loss of his sword and he took Brigid into the fort to meet the king. The king asked her if she intended to give his property away to the poor also. Brigid answered that if all the wealth of Leinster were at her disposal, she would give it away to the King of the Elements. The king said that Brigid’s status was higher in the eyes of God than among men. He gave a sword with an ivory hilt to Dubhthach on Brigid’s behalf and he made her a free-woman. Brigid went, along with other virgins, to Telcha Midhe, to receive a nun’s veil from Bishop Mel. It happened that through the bounty of the Holy Spirit, the rite of ordination of a bishop was read over Brigid. MacCaille, another bishop, said that it was not right to confer the status of a bishop on a woman. Bishop Mel replied: “We have no power over it, because it is from God himself that this honour came to her – an honour beyond that of any other woman.” For this reason, Brigid and her successors (coarba) were always regarded as having the honour due to a bishop. Eights in Brigid’s lifeIt was on the eighth day of the moon that Brigid was born; she took the veil on the eighteenth day; she went to heaven on the twenty-eighth day; she was consecrated along with eight virgins and she lived her life in accordance with the eight Beatitudes. Abundance and healing at EasterWith one sack of malt, Brigid succeeded in providing beer for the seven churches of Tulach for Holy Thursday and the eight days of Easter. On one occasion, Brigid went to a church in Teathbha for the celebration of Easter. On Holy Thursday she washed the feet of the people in the church. Among them were four who were very ill. Brigid cured all four of them. Victory over the Uí Néill for the king of LeinsterBrigid made two requests of Dunlaing, king of Leinster, and promised him the kingdom of heaven for himself and his son as a reward. The king, however, took little notice of this promise. ‘I can’t see the kingdom of heaven,’ he said, ‘and nobody knows anything about it. For that reason, I don’t bother about it at all. As for granting the kingdom to my son, I don’t bother about that either, for I myself won’t be around. But give me a long life in my kingdom and give me victory over the Uí Néill in battle, and above all make me win the first battle against them to give me courage for those to follow.’ This was granted, and the king won a great victory over the Uí Néill in the battle of Lochar. Once Brigid asked a king to set a certain prisoner free. The king refused her request but he handed over the custody of the prisoner to her for one night. Brigid appeared to him and she instructed him to recite the hymn Nunc populus when the chain which bound him was loosed. He was then to turn to his right-hand and run as fast as he could. He did this and escaped from prison. One day when Brigid was travelling in Maigh Laighean (the Plain of Leinster) she met a student and he was running. ‘Where are you rushing to?’ Brigid asked him. ‘I’m going to heaven,’ he answered. Brigid recited the Our Father with him. He was Ninnid Lamh-Idan who when Brigid was about to die came to her to give her Holy Communion. Bishop Ibar helps Brigid mark out Cill DaraBrigid asked to Bishop Ibar to mark out her city for her. They arrived at the place where Cill Dara now stands. It happened, just then, that Ailill MacDunlainge was going through Cill Dara with a hundred horse-loads of wooden posts. Two of Brigid’s women came and asked Ailill to give them some of the posts. Ailill refused. With that, the horses were glued to the ground and were unable to move. Ailill was forced to give Brigid all the posts and it was with these that she marked the boundary of her monastery in Cill Dara. As a reward, she said that Ailill’s heirs would have the sovereignty of Leinster for ever. Brigid and the lepersOn one occasion, Brigid gave a cow to each of two lepers. One of them was a proud man and began to insult her. As they were crossing the Barrow, the river rose up against him and he drowned. The humble leper and his cow managed to cross in safety. 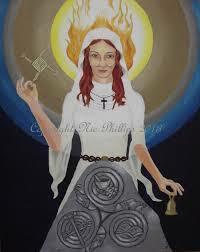 The Queen of Leinster came to Brigid and gave her a silver chain as an offering. Brigid gave the chain to her nuns and they hid it away without telling her, as she was always giving away things to the poor. 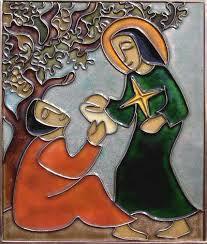 A leper came along and Brigid gave him the silver chain. The nuns were furious when they heard that the chain was gone. “Your mercy to everybody is of little use to us,” they complained, “while we ourselves are in need of food and clothes.” “You are a bad lot,” said Brigid., “Go to the church, to the place where I pray, and you will find your chain.” They did so and there was the chain even though she had given it to the leper. 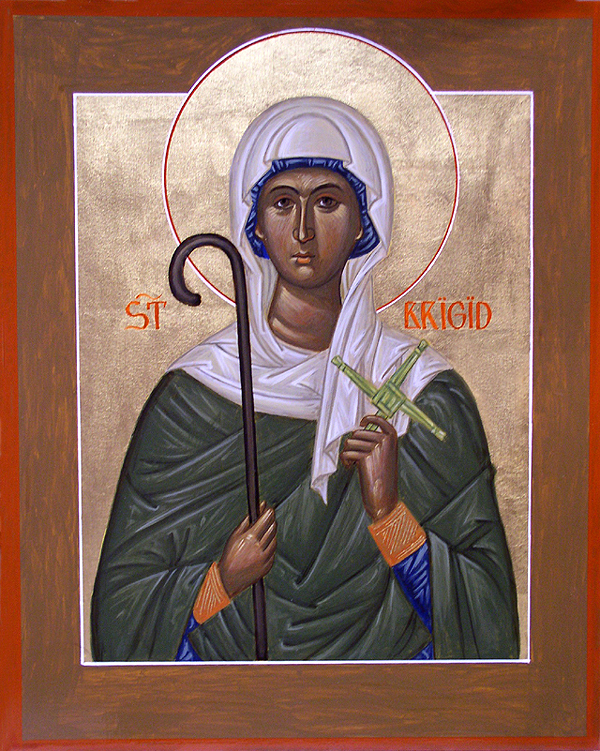 Her deathAfter Brigid had founded many monasteries and performed many miracles, she came to the end of her holy life. Generous, patient, humble and forgiving, she was always joyful and steadfast in the service of God.